Whatever the beverage, there's no better way to cool down than with a Liquid Dispensing Keg. 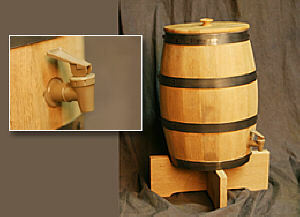 Available in either a 5 or 15 gallon size and made from authentic, coopered American White Oak. These kegs come with a plastic liner, lid with knob handle and tap. Perfect for back yard barbeques, parties and promotional events. Shown with optional stand. *Ships UPS Oversize due to keg dimensions Please note: These kegs require 4-6 weeks for shipping due to the hand crafted process.